When you visit a Beauty Salon in Brisbane, one of the most important factors in determining whether the salon you've chosen is right for you, is if you've achieved your desired results. At Simply Laser, we understand everyone's skin is different. Whether your objective is to wind back the clock, to treat congestion or other skin issues, to enhance your features, or to just develop and implement a routine your skin agrees with, we take great pride in producing positive results for all of our clients with personalised, effective treatments. We've had some incredible feedback from clientele who've had tailored beauty and skin care treatments with us, and achieved some great results. Here are just some of those results below. Karlie first came to our beauty salon in Brisbane approximately 12 months ago. She had just stopped the contraceptive pill and was experiencing some skin issues. We personalised Karlie's treatments to target pigment and congestion, through our Signature Facelift Peel, devising a personalised skin care regime. She also had her eyebrows micro-bladed. She loved her Simply Laser results. Ellen had regularly suffered from hormonal acne issue, during her pregnancy and shortly after the birth of her daughter. She embarked on a treatment program with us in early 2018. We recommended a plan of dermapen skin needling, which is a great way to treat skin textural issues including acne, fine lines, stretch marks and even acne scarring, as well as regular facials. She also adopted a skin care routine of natural products, and reduced the amount of makeup she wore. After regular visits to our beauty salon in Brisbane, her skin has seen a complete turnaround, with great improvements in the texture of her skin and fewer breakouts. She says to make sure to find out what works for your skin, as every skin type is different. She also says to "invest in the best treatments and products you can, and always look after your yourself, your skin will thank you." 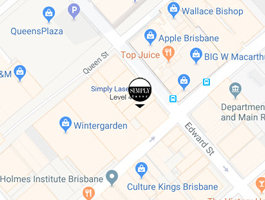 Sinead had heard good things about our beauty salon in Brisbane, and visited Leona while she was conducting her monthly clinic placements in Sydney. She has naturally fair hair and sparse brows that required drawing in daily. After researching micro-blading, she decided she was a suitable candidate for the treatment, putting her brows in the hands of Leona. The results completely changed her makeup routine and her face, bringing out her blue eyes and framing her features. Contact the Simply Laser team to discuss your skin issues, your desired outcomes and more about different the treatments we offer. Alternatively, come visit us in our new salon on Edward street in the Brisbane CBD. We'd love to hear from you.